See also HellDrivers by chock32. Attempt at a font that mixes triangular and rectangular glyphs. Some words don't look too great in it but on the whole I'm pleased with the result! Info: Created on 8th May 2012 . Last edited on 10th May 2012. Great! I like your sharp style. Not sure about J, maybe M could be improved too. Excellent sharpness as usual. Even if the typography is obviously different , i can't help thinking to the legendary Master of Puppets from Metallica! Have you tried a more regular increased spacing between words ? I think this "nospace" style adds more confusion than style, actually. @Yautja I agree with you on the J, it was the last letter glyph I added. I guess I just preferred something more leftfield to my original plan of a simple right angle (á la the H/T). The M was mainly so Ms and As together created a sort of "thunderbolt" image, exactly why I chose to include "ama" in the font name (it doesn't show this in Fontstruct sadly, though it will anywhere the default font preview is the name of the font, in the font). I think the irregularity and tight spacing is something I've adapted from looking at, and drawing inspiration from, various dubstep/electro artist logos. It seems to be pretty common, even though in some cases (especially thanks to how many of them have bizarre names) it becomes almost illegible. 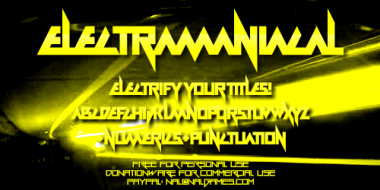 For the next one (I'm sure there'll be one haha) I'll play around with clearer styles and see if I can maintain the electro/dubstep look while giving the letters room to breathe and the text it makes easier to read. Congratulations! FontStruct Staff have deemed your FontStruction worthy of special mention. “Electramaniacal” is now a Top Pick. @Yautja I've edited the lower-case "j" to your suggestion, it does look better. Cheers! @meek Thanks, really chuffed you think it's good enough to warrant that! I find this type of design a bit... an oxymoron! The diagonal lines works good for a "electro/dub" feeling but vertical lines breaks the concept! As a modular type, you can improve the soundness doing glyphs similar, like m and n, and changing glyphs like i and t (for exemple: iti seems a m!) keeping up the legibility and the readibility. I like how this font has no space and made some vertical lines left there, like in "D and E" or "F and G"! I love this font. Thank you. Very good font. It's great how some of the sides of the letters are vertical and some are slanted. But if you want to type a vertical glyph and a slanted glyph, it doesn't work as good. Maybe you should put alternates in the lower-case slots to solve this problem? That is what I did in my clone of Vermin Vibes Redux. This is the first font from Fontstruct(found on dafonts) that I would see in use. State of Mind game. It is very cool. Happy New year to you! Oh, cheep, I think someone is trying to resell your font as vector alphabet via shutterstock.. As I dont think this is you, right?